There’s nothing quite as frustrating as losing a key – let alone an entire set of them. But don’t despair. Everyone loses keys and other important items at some point or another. Fortunately, a skilled locksmith can come to where you are at any hour of the day and make a new key in short order. Sometimes, it’s not that you’ve lost your key. In fact, you know precisely where it is – right on the other side of that locked door. You’ve Locked Your Key in the Car. We’ve all experienced that sinking feeling. You can see your keys dangling from the ignition, but the door is locked and there’s no getting it open. Maybe you’ve even left the car idling in the ultimate display of absentmindedness. A mobile locksmith is exactly what you need in this situation. The Key Has Snapped in the Lock. 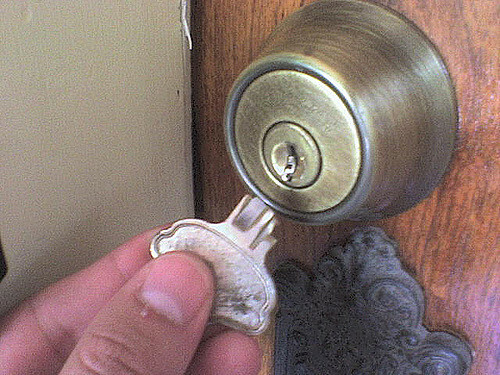 Keys and locks wear out over time, and this can sometimes lead to a snapped key stuck in a lock. The good news is that a competent locksmith can remove the broken end from the lock and originate a new master key – even if the original is in pieces. You’ve Forgotten the Safe Combination. Safe’s can be like that email address that you only log in to check once or twice per year. When it comes time to access it, you simply can’t remember the combination. If you urgently need it open, a 24/7 locksmith can assist. You’ve Just Purchased a New House. This is something that simply cannot be stressed enough. If you’ve purchased a new property – be it a home or business – the first order of business should be to change all the locks. Call out a locksmith for a quick security audit and a new set of locks that are guaranteed not to have duplicate keys floating around out there. Someone Has Broken into Your Property. When a property is broken into, the first thing to do is notify the authorities. The second is to change all of the locks. In Australia, 20 per cent of houses that are broken into once is then burgled again. Assume that they got hold of a spare key, and protect your property from a future intrusion. You Want to Enhance Your Property’s Security. Following on from the previous point, it never hurts to call out a locksmith to see if your home or office could be made more secure. There are hundreds of thousands of burglaries and attempted break-ins in Australia each year. A qualified locksmith can help prevent your property from becoming a statistic. Have you found yourself in any of the above situations? Action Lock Service can assist. Call us on 08 9240 7200 to order a 24-hour locksmith to your location now, or send us an enquiry via the Contact page to learn more.